The Spring 2019 La Crete Conference is part of the Mackenzie County Organic Success Program, which is a partnership between Organic Alberta and the Mackenzie Applied Research Association. The goal of the program is to support local transitioning and organic farmers. Over half of the organic producers in Alberta are now in the Mackenzie County Region. Your sponsorship will be applied to and showcased at all activities in the region until March 1, 2020. 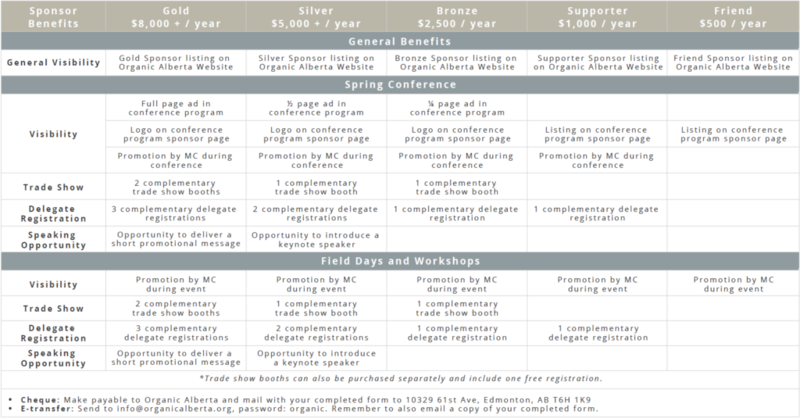 This will give you multiple opportunities to showcase your support for the local organic producers, including yearly spring conferences, summer field days, and workshops throughout the rest of the year. E-Transfer: Send to debbie.miller@organicalberta.org, password: organic. Remember to also email a copy of your completed form.